Limited infrastructure, inequitable access to digital resources, and poor utilisation of digital resources in the education sector cause the digital exclusion of children in India. With a computer-student ratio of just 1:89 in India, initiatives such as Zero Connect–Wireless Agariyas employ vans equipped with antennae, solar panels and digital equipment to take internet connectivity and tablets to students of the Rann Shalas in the salt desert. Digital exclusion in India is the result of three major factors—limited availability of digital infrastructure, inequitable access to digital resources (and capability to use them fully), and lack of emphasis on optimum utilisation of digital resources in the education sector. We look at each of these and try to see how they can be addressed. World Bank data (2016) on internet penetration show that only 29% of Indians are onlineDigital exclusion is more pronounced in rural areas. 68.86 urban internet subscribers per 100 population, against only 13.08 rural internet subscribers per 100 population at the end of 2016 (TRAI 2017). Youth (aged 15–24 years) are the most connected group worldwide, with 71% online compared to 48% of the total population (Unicef 2017). Digital exclusion in India contrasts sharply with countries like Europe, where only 1 in 25 are digitally unconnected. Access to infrastructure in general, and inequitable access in particular, is a major problem contributing to digital exclusion. The second major problem is one of inequitable access. In the context of schools, specifically, the picture of digital exclusion gets murkier. It is difficult to get direct data on internet connectivity in schools in India. However, the national aggregate on learner-computer ratio is reported to be 1:89, which suggests the stretch on computer resources and the extent of inequitable access (Partnership on Measuring ICT for Development 2014). India has been making efforts to address the problem of digital exclusion in government schools by taking up projects like Computer Literacy and Studies in Schools (CLASS). This was launched in 1984 as a joint initiative of the Ministry of Human Resource Development, Department of Electronics, and NCERT (NCERT 2006), in which BBC microcomputers were distributed to 2,598 secondary and senior secondary schools through state governments. Though these initiatives were able to increase computer literacy in small pockets, the human resource ministry’s Programme of Action (POA) 1992 on the National Policy on Education 1986 states, “Close scrutiny of the implementation strategy and achievements of the project shows that the project has not met with the desired degree of success; mainly on account of shortcomings in the implementation strategy” (Government of India 1992). Implementation was beset with problems such as lack of coordination between the resource centres (where the computers were kept) and the project schools, time gap between installation of systems, training of teachers and activities in school, no provision for computer literacy programme in the timetable, ambiguity of purpose, and use of information technology as an add-on and not as an integral part of the learning process. On top of this, despite the push towards Digital India and digital education, the government (Jaitley 2018) has cut down fund allocation for e-learning from Rs 518 crore to Rs 456 crore in fiscal year 2018–19. However, it has pegged an allocation of Rs 250 crore for the World Class Institutions plan, but the emphasis continues to be on infrastructure. they could do more on their smartphones, which gave them easier access to the internet and its infinite content, while the laptop required additional internet connectivity. In most cases, the laptops began to be used only to watch movies on CDs and pen drives. Karsenti and Collin (2012) identified several benefits of the One Laptop Per Child initiative in Canadian schools: greater student motivation; greater student attentiveness; increased interaction among students, teachers and parents; individualised, differentiated learning; development of ICT skills; more opportunities for students in the future; and decrease in school dropout rates, among others. However, they also identified several challenges: the technical challenge—lack of immediate troubleshooting for computer breakdowns and malfunctions, and lack of seamless internet connection; and the pedagogical challenge, where digital tools are introduced in education but the method of teaching is still oriented towards pen-and-paper. These are very relevant challenges in the Indian context. Digital inequities are also exacerbated because of a lack of emphasis on optimum utilisation of the available resources. For instance, according to a report by Nikhil Babu (Indian Express 2016) aptly titled Not Web, but Cobweb, under the unified Delhi Municipal Corporation, computer labs were set up in 1,381 schools in 2005 and teaching of computers was outsourced to two private companies. Since 2010, the municipal corporation has not hired computer teachers, and as a result, the computers have been gathering dust in North and South Delhi Municipal Corporation schools. These schools are looking for funds to restart the project. Schools in the East Delhi Municipal Corporation halted the project but started a similar one in 195 other schools. The use of digital technology in education will help address several problems. Even though conventional literacy rates have reached 74.04%, India continues to face lower enrolment of female children, high dropout rates, low retention of knowledge, and poor attendance of teachers. A UNESCO study states that as many as 47 million students drop out of school by Class 10 in India (FirstPost 2016). Several social and economic reasons contribute to this high percentage of school dropouts in India. The absence of proper infrastructure is also a contributory factor. For example, young girls drop out of school after they hit puberty due to lack of proper toilets. These are challenges that information and communication technologies (ICTs) can find solutions to, if optimally utilised. android-based mobile app allows students, teachers and government authorities to capture geo-tagged and time-stamped photographs and information about existing, non-functional and missing infrastructure or amenities—drinking water, separate toilets for boys and girls, clean kitchen for mid-day meals, and boundary walls, among others—to ensure school compliance with the provisions of the Right to Education Act of 2009. Above all, in an information society, access and optimal utilisation of ICTs not only enables marginalised sections of society, including children, to access information online but also helps them access socioeconomic and cultural benefits, thereby potentially enabling them to break the circles of poverty that their parents and grandparents have been trapped in. This is a compelling reason to optimise utilisation of ICT. Optimising ICTs in education means showing who is master, recognising what the technology can do and harnessing it to the needs of education, not merely following where it leads (UNESCO 2012: p 67). As Trucano (2005) rightly points out, “Introducing technology alone will not change the teaching and learning process. The existence of ICTs does not transform teacher practices in and of itself. However, ICTs can enable teachers to transform their teaching practices, given a set of enabling conditions. Teachers’ pedagogical practices and reasoning influence their use of ICT, and the nature of teacher ICT use impacts student achievement.” For an optimal utilisation of digital technology, computers and tablets need to be integrated more organically into the teaching curriculum, with digital tools and ICTs leveraged in such a way that they are not a supplementary subject, rather a complementary tool for all other subjects. Similarly, the internet in the classroom should not be seen as a distraction but as an enabling tool to learn all subjects with greater understanding. A Sengjan, who teaches nursery, kindergarten and Class 1 students at a school in Tura, Meghalaya, uses this approach of integrating technology. He teaches students communication skills and about the animals of India, among other things. “But not all animals and birds can be found in the Garo Hills. Zebra, giraffe and peacock are only names they have heard in classrooms. They do not know what they sound like. So I play videos on the internet in class for the children to hear. That’s how they learn to recognise these animals,” he says (Chaturvedi n d). In the Little Rann of Kutch, Gujarat, Digital Empowerment Foundation has been able to improve access to quality digital educational resources in makeshift schools called Rann Shalas that are run in huts made of jute sacks. 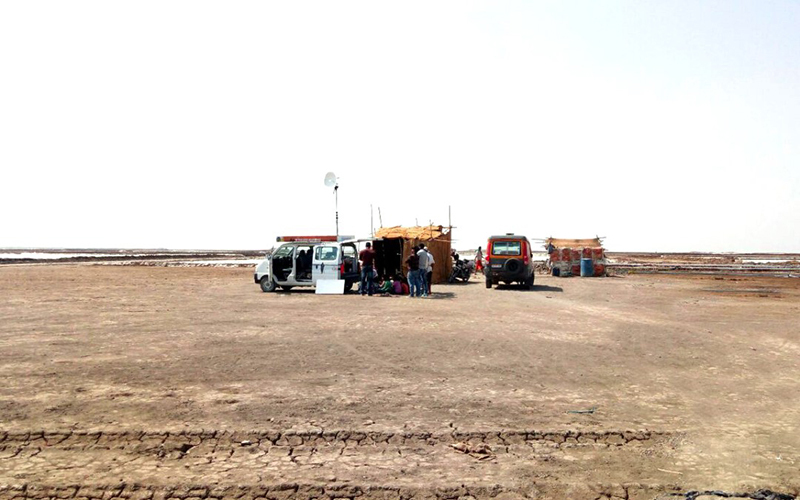 A specially designed van with built-in digital equipment, rooftop solar panels, back-up batteries and an expandable 5-metre tripod-based antenna tower with dish antenna brings internet connectivity and internet-enabled tablets to the students of the salt desert every day. This initiative, called Zero Connect: Wireless Agariyas, connects 372 students of the Agariya salt-making community across 15 Rann Shalas to each other and the world. Teachers and students at the Rann Shalas are being trained in digital literacy and use of ICTs in the learning and teaching process. With improved access to edutainment content, student attendance and engagement in schools has increased, and so has retention. This impact is also visible in Andrew Garton’s film Ocean in a Drop, which shows tribal children of Baran in Rajasthan learning English for the first time by picking up words from a tablet-based interactive game for English learning. The Tata Trusts’ Integrated approach to Technology in Education (ITE) project believes that “to ensure that ICT is not an additional subject in the classroom, it is important to integrate technology into the lesson plans and classroom practices, an approach that improves teaching and learning and fosters authentic and project-based learning for older children and adolescents in some of the most underprivileged geographies” (Tata Trusts n d). Smartur 3D is another effective learning tool. An android app developed by a Hyderabad-based start-up, Smartur 3D enables visualisation of concepts in physics, biology and math through stereoscopic 3D, augmented reality and interactive 3D. The app includes study modules, flash cards for quick revision of concepts, and game-based practices (Pilla 2015). Developed for the NCERT CBSE textbooks, this app helps students understand scientific concepts. Just scanning a diagram in a textbook using the app will play a 3D visualisation of the concept. To answer the question raised at the outset—what will it take to bring India’s children online?—it is necessary to shift the focus from infrastructure-provisioning to optimal utilisation of ICT resources. To do this, it is necessary to ensure that all teachers at government schools are digitally literate and trained in integrating ICTs in teaching practices. While ICTs alone cannot magically solve endemic problems, efficient use of ICT tools can improve accountability and transparency of systems, leading to gradual efficiency. Osama Manzar is Founder-Director of the Digital Empowerment Foundation (DEF). He is a member of the advisory board at Alliance for Affordable Internet and has co-authored NetCh@kra: 15 Years of Internet in India and Internet Economy of India. Udita Chaturvedi is a media researcher and Senior Communication Officer at DEF. She writes on digital inclusion, with a focus on women and children. The authors thank Zothan Mawii for reviewing this article. Brand India Equity Foundation (2018): “Educational and Training Industry in India: Sectoral Report,” http://bit.ly/2pjHdkV. Chaturvedi, Udita (n d): “DEF in the Land of Clouds,” https://spark.adobe.com/page/OWzY3BRiQmaZO/. FirstPost (2016): “UNESCO: 47 Million Youth in India Drop Out of School by 10th Standard,” Aug 17, http://bit.ly/2pjKJLN. Government of India (n d): “Information and Communication Technology@Schools,” Ministry of Human Resource Development, New Delhi, http://mhrd.gov.in/sites/upload_files/mhrd/files/upload_document/ICTold%20scheme.pdf. —(1992): “National Policy on Education 1986,” Ministry of Human Resource Development, http://mhrd.gov.in/sites/upload_files/mhrd/files/document-reports/NPE86-mod92.pdf. Jaitley, Arun (2018): “Budget 2018-2019: Speech of Arun Jaitley, Minister of Finance,” Feb 1, www.indiabudget.gov.in/ub2018-19/bs/bs.pdf. Kremer, Michael et al (2004): “Teacher Absence in India: A Snapshot,” Journal of the European Economic Association, http://bit.ly/2pfVvCb. Pilla, Viswanath (2015): “Smartur’s 3D App Aids in Digital Teaching,” LiveMint, July 5, http://www.livemint.com/Companies/ZzMOGoEdq6C8oVP9vxagnL/Smarturs-3D-app-aids-in-digital-teaching.html. TRAI (2017): “Indian Telecom Services Performance Indicator Report,” Telecom Regulatory Authority of India, www.trai.gov.in/sites/default/files/quarterly_press_release_Eng_07042017.pdf. Unicef (2017): Children in a Digital World: State of the World’s Children in 2017, Unicef, www.unicef.org/publications/files/SOWC_2017_ENG_WEB.pdf. Vipul, Vivek (2018): “Budget 2018: Falling Education Spending Aggravates India’s Learning Crisis, Wastes Its Demographic Dividend,” IndiaSpend, Jan 31, http://www.indiaspend.com/cover-story/budget-2018-falling-education-spending-aggravates-indias-learning-crisis-wastes-its-demographic-dividend-96241. With the worst 4G speed in the world, is India just chasing headlines on digital economy? Right to Privacy: What do the limitations mean and how will they impact you?